Club Penguin Cheats by Mimo777 Club Penguin Cheats by Mimo777: Rockhopper Arrives On Club Penguin Island! These items are really old! I am sure there are going to be lots of penguins glad to get them. And, if you notice, the background is treasure from the Underground Cave. Speaking of that, did you check it out? Smoove! The golden puffle is in the Cave! Will we find Yarr there also? Watch for our reliable Mimo Comment Tracker coming soon! Scroll down for Penguin Style Catalog Cheats! whoa nice! did you say golden puffle? because i think thats yellow? have you met rockhopper how many times? Sorry to say, but it looks just like a yellow puffle..................... Trust me, I'm disappointed too. I checked it out for myself and it's deffenitely a yellow puffle. But on the other hand, the stuff RH brought back is awesome! I bought like 50 of the chairs! ALso, I'm SOOOOOO glad to hear about a mimo tracker! I've been trying to find you for YEARS! (Still haven't succeeded yet, however). If you put the chairs together it looks like a barrel! Lol! Mimo I saw you on cp today! YOU ARE SO AWESOME! Waiiitt a second... Isnt that a yellow puffle? That is cool i want to become a mod can you help. Yarr's in the underground cave! So is the green puffle from the night club! Yeah...IT'S MISSING TOO! After I saw the yellow puffle in there, the thing in the newspaper about how the puffles love it, and the fact that Yarr and the green puffle from the nightclub are missing, I knew that CP will let us in there soon and we will find all of those missing puffles! i think its a yellow puffle in the cave, and if we DID find the golden puffle, that would be 2 new puffles in 2 months, and most of the puffles come out at least a year apart. mimo, maybe the puffles are being lured in there by herbert and his mysterious seeds. I think he wants to use them to power his machines or something. I hope you agree. Please post! I've left lots of comments and none have ever been posted, please, please! it cant be a golden puffle it has the same color tongue as the yellow! Hey Mimo, you should do another Mimo Q&A this month!! I never got to ask a question the last few times!! 4. Only put "CPG Mod" after your name if you are modding. If you look on the right hand side of Mimo's blog, scroll down far enough you will see mod rules. Check that out! Good luck! Nice Mimo! If you haven't checked the Dance Club, the green puffle that used to be there is gone! Maybe that was the missing puffle Rory was talking about! Even though, I went to Club Penguin as soon as I came home! 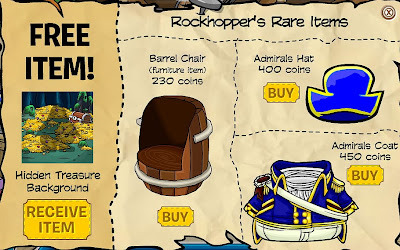 I was so exited about Rockhopper coming to Club Penguin! Even though I've met him already. This is for all of you who say its a yellow puffle. P.S. I may not Mod tommorow. Me and my friend are doing a contest thing for instruments! Wish us luck! Rockhopper lost yarr, it says on the notice board. :( boring stuff rh brought! its a yellow puffle not a gold!!! Mimo i have always wanted to meet u on cp but im in aus :( and can someone tell us where RH is PLZ! Dang no items for nons! The green puffle is gone from the night club! So thats where the stage puffle went... I've been looking for ages! I do believe it is yellow, but maybe it is gold! =D mimo has met Rockhopper many many times. I would say maybe 7-8 times or even more! Oh no they brought back the captain crunch hat! That was the best and most rare item :( It was for uber people only! Probably a bunch, I thought it was yellow too! Of course! Just answer questions people leave in comments, then put your name as ______(CPG Mod)! Hope to see lots more of you! Awesome! It's not everyday someone sees mimo walking around town. I think by "mimo tracker" mimo meant a Rockhopper tracker. It would by cool if there were a mimo tracker though! If you're a member he brought things! That would be horrible if Herbert did that! But thats probobly it. Remember, a new RESCUE game is coming up! Maybe it means we rescue the puffles! I think that there is a new server! Hopefully it is. I found my friend on Polar Bear. Polar Bear is the server. Awesome. No, Polar Bear is old. I think a mimo tracker is a comment tracker that tells you where RH is not where mimo is. But maybe your on to something. A mimo tracker! Like if mimo did something like if once a week he would tell us when he is on and he will stay on for like 30 minutes or something! Sure! To become a mod, answer peoples questions and put (CPG MOD) after your name when you answer a question! For more information go to Mimo's site and on his right sidebar it will have rules! ♥♥♥♥♥♥♥♥♥♥♥♥♥♥♥♥♥♥♥♥♥♥♥♥♥♥♥♥♥♥♥♥♥♥♥♥♥Dear Twllio it cant be Yarr cause yarr has a orange tongue this puffle has a blue tongue..
♥♥♥♥♥♥♥♥♥♥♥♥♥♥♥♥♥♥♥♥♥♥♥♥♥♥♥♥♥♥♥♥♥♥♥♥♥LOL me too hehe im gonna unwrap it and eat it...*tries to upwrap puffle* uh oh its not chocolate! Sorry but i dont thinks thats a new one. Me is back! Sorry, I had this really big project for skool, and I mean BIG! So...I am back! Actaully, there is a yellow puffle in the stage right now! Remember? It always takes a part. It's just that, you have to wait a while, but the puffle comes by in a boat! Yeah, I think that it is yellow. But who knows? I haven't been here for a LONG time! ...Well two days but STILL! Yeah, I think it is a yellow puffle! Good catch! First, ouch! You are hurting my ears! Second, you did?! You are so lucky! I only have twice, one as just a lucky time waaay back, the second as one of his recent CP parties! Oh, and don't put (CPG Mod) unless you are Modding, ok? Yeah, I really think so! It's got the bloo tongue and everything! I can help! I'm always glad to (try to) help others! Ok, so one key thing is to never put (CPG Mod) unless you are responding to a comment!...Like I am! And, here is the most common and useful way to do this: Copy and paste the comment into the comment box, then seperate your comment from theirs, like i did, or any way you like! Good luck, and I hope I helped! Ok, sorry, but I am just so excited! Herbert is behind all this! Herbert came because he know RH was coming. He is stealing CP's well known puffles, like Yarr! And he is using them to, umm...(Haven't gotten this far, got to brainstorm!) But so far, Herbert is my #1 suspect! Yup! Where could Yarr be? Mimo can sadly only meet Mimo Mods or higher. Sorry! Try Modding, it it really fun! Well, RH is only out every so-often. Just keep looking you can find him! I think that the golden puffle might be Yarr dipped in gold paint! In one of the CP stories, it has a similar story. What do you say Mimo777? I've also noticed some puffles are missing! The green puffle is gone from the disco! Could puffles be hiding in the cave? Polar Bear has been there. Sorry! Maybe that undergrond mine place is a secret hideout for puffleswho have run away from their owners! yes, you were correct. but I think mimo's just being Phunnie! The classy T shirt in the new clothing catalog looks just like the tux T that we got to vote on a while ago. I wanted the tux T to win instead of the paint splatter. Mimo will have a RH comment tracker up and running soon. i just earned, like.... over a thousand coins just playing Treasure Hunt. That's kind of sad, but you gotta admit -- the game's pretty dang addicting. You get me? Poor yarr. Wonder where he is. I really want an iPod Touch. Wow I cant believe THEY (excuse caps) are on. Cool Sorry but im pretty sure thats a yellow puffle. The stuff Rh brang is pretty cool. I rekon it has somethin to do with herbet. It's kinda obvious. Answer questions like this, be helpful, and congratulate winners of competitions. For more info, look at Mimo's modding post. If you scroll down, you'll see that Mimo has already posted that. Sorry, but polar bear is old. Thats not the golden puffle. It's the yellow puffle. It has a blue tounge. And, they would never make a golden puffle, because if it was solid gold, it wouldn't be...real. billybob said there would be a new game coming up right? well i think it's going to be to rescue yarr! maybe...maybe yarr fell into some paint rockhopper had then got into the cave somehow. yep. mimo just made a little mistake...i think. Im thats a yellow puffle not a gold puffle waddle on!! !